Misty Creek, located in downtown Helen, directly behind the water park and walking distance for an avid walker, or a short ride to all the main attractions Alpine Helen has to offer, is a 2 Bedroom that sleeps 6 comfortably. This cozy open plan home situated along a babbling creek is also accompanied by lower level hang out with fire pit, hot tub and lounge area. 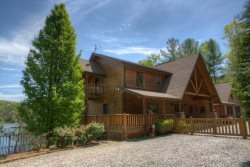 Once inside, this two level A Frame home with gas log stonewall fireplace and open area living, kitchen and dining area is that perfect central location for everyone! After enjoying all that Helen has to offer, enjoy the back upper deck seating area with gas grill or just cozy up to the fire pit just below with s'mores in mind for that kid in you. Plenty of seating for everyone! Don't forget to have your firewood delivered for that perfect night with the stars! Welcome to Misty Creek, a downtown favorite for everyone in mind! The best Helen cabin that we have stayed in. This cabin was super clean and in a convenient location. We were also visited by a mother bear and her cub. One of the nicest and cleanest cabins we have stayed at. No complaints. Everyone is very friendly and very helpful. Your team is tops. Very concerned with the guests needs and the response time is very fast especially for a Christmas weekend. 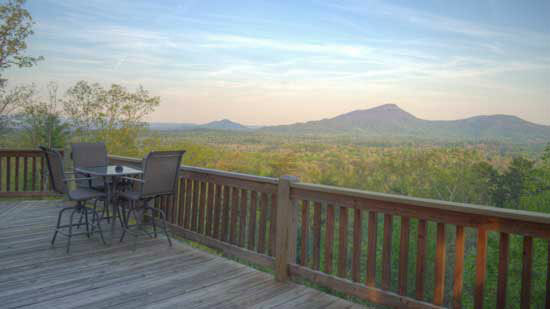 The best comment I could list would be, Pinnacle will be our first call when we want to rent a cabin. Excellent! Responses to question were answered promptly by staff. Jill and Ashley were very helpful! Our stay in Misty Creek was very good. It was a short visit (Friday afternoon to Sunday morning) but the time spent in the cabin was well worth the upgrade from a regular hotel room. A longer visit during which we had the opportunity to use more of the facilities would have been excellent, were certain! Team was great. I explained what I was looking for and she matched me up with a perfect rental. Would love to come back soon! I experienced no problems. Everything was as represented. Only problem was that we didn't stay longer. From the very start, the customer service was excellent! The lady we spoke with helped find exactly what we were looking for. She was very nice and made the payment and rental agreement procedures easy. The cabin was above and beyond what we expected! We booked the day before, so we had the mindset that it wasn't going to be that great, but we were completely wrong. It was perfect for our family of six! We enjoyed the board games, hot tub, and fire pit that we used to cook s'mores. The location was walking distance to the town and tubing, so that was also perfect!Fabulous vacation and cabin! It was easy and straightforward. The staff were courteous, helpful, and extremely nice. Couldn't have asked for anything better. Seeing a black bear on the morning of checkout was a thrill I won't soon forget. The staff at Pinnacle were always friendly and helpful. Misty Creek was a wonderful place to stay! It was furnished so nicely, and was a very relaxing place to be. We are already looking to come again in the summer! Very nice, and we really enjoyed it. We absolutely loved this rental! It had everything we needed. It was very close to the main road. Our kids loved the fire pit, creek, and outside playing area. The rental was also well stocked with games and movies. The beds were comfy and the rental was very clean. Ashley was extremely courteous, helpful, and pleasant each time I spoke with her. The maintenance man was very friendly and helpful. I spoke with Jill once and she was friendly also. This property met all our needs and wants; great family-oriented-outside picnic table- great for cookouts or crawfish boils(if you are from Louisiana) and a porch swing-always touches my heart.The fire pit for cozy gatherings with the sound of water flowing in the nearby creek. The house was immaculate with CLEAN bathrooms. The beds were very comfortable with plenty of warm covers.